Sources in Congress now indicate that it could be adopted without repealing the Jackson-Vanik amendment. U.S. Congress postpones the repeal of Jackson-Vanik amendment and it will not be passed in tandem with the "Magnitsky Bill". Sources in Congress are not discounting the possibility that lawmakers in the autumn might only approve the "Magnitsky Bill", (which is not causing any disputes among lawmakers), and postpone the repeal of the Jackson-Vanik amendment for an unspecified time. This threatens to kill off the "reset" - Barack Obama's main Russian foreign policy achievement. U.S.-Russian relations have entered into a new period of uncertainty. Since the beginning of July, sources in the U.S. State Department and the Russian Ministry of Foreign Affairs have been saying with some confidence that everything will be resolved in August. They anticipated that at the beginning of the month, the U.S. Congress would replace the Jackson-Vanik amendment with the "Magnitsky Bill ahead of Russia’s accession to the WTO. However, Congress has failed to meet the necessary deadline. U.S. lawmakers went on recess Aug. 6 for five weeks. Only eight days have been schedules for legislative business in September, and after that comes the break for campaigning ahead of November elections in the United States. This sets back debate on Jackson-Vanik by a minimum of three months, and realistically the issue will only be taken up in six months, after the new Congress comes into session. However, this issue has been discussed at length. The current problem for bilateral relations is new rumors that U.S. lawmakers might approve the Magnitsky Bill without repealing Jackson-Vanik. Last week Rep. Ileana Ros-Lehtinen (Republican-Florida), head of the Foreign Affairs Committee in the House of Representatives announced that she did not believe it was necessary to repeal the amendment. According to her, Moscow did not currently deserve "such a present" and the Russian position on the Syrian question had forced discussions to center on the need to adopt the Magnitsky Bill and postpone the trade law until next year. 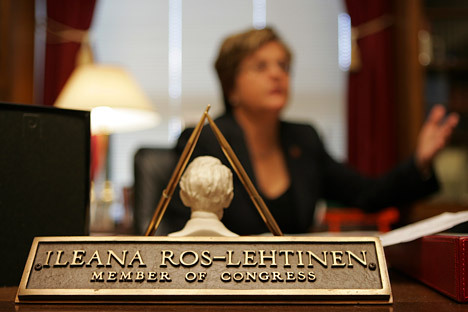 Ros-Lehtinen's announcement was supported by a large number of influential members of Congress. This state of affairs has put the White House in a tricky position. On the one hand, the administration was hoping for a swift repeal of the Jackson-Vanik amendment. U.S. Secretary of State Hillary Clinton was planning to officially announce the end of the trading restrictions at the Asia-Pacific Economic Cooperation Summit in Vladivostok at the beginning of September. And on the other hand, the Obama administration has been trying to avoid adopting the Magnitsky Bill, wary of causing any sharp deterioration of relations with Moscow. When Congress decided to link the two issues, the White House saw this as an unavoidable compromise and stopped forcing through the repeal of the amendment. "For the last few weeks no one in the administration has even called us regarding Jackson-Vanik," said a source in Congress. At first glance the postponement of the repeal and the adoption of the Magnitsky Bill by Congress would appear to be in the White House's interests. "It's evident that in an election year, the administration is more likely to agree to American businessmen suffering some losses, but it does not want to enter into another diplomatic skirmish with Russia," said political analyst Richard Darcy. However, the refusal to quickly force through the repeal of the amendment threatens to backfire on the White House. There are no particular disagreements regarding the Magnitsky Bill in Congress and it could become law in September. But without any tie-in to the lifting of the trade restrictions, this will cause a violent reaction in Russia. The Russian government and Foreign Ministry have repeatedly declared that they consider it unacceptable to substitute the Jackson-Vanik amendment with the Magnitsky Bill, and the adoption of the Magnitsky Bill without the repeal of the amendment will be seen as nothing short of an insult in Moscow. And that could be the final straw for the reset. Firts published in Russian in Kommersant Daily.